A San Jose woman is back in the Bay Area after witnessing the violent rally in Charlottesville. Kristin Savini and her husband were in Charlottesville to drop off their daughter at med school. But when they heard about a protest nearby they decided to check it out. And that's when they saw something they say they'll never forget. On Saturday, Savini and her husband found police marching with shield and a tank roaring down streets. 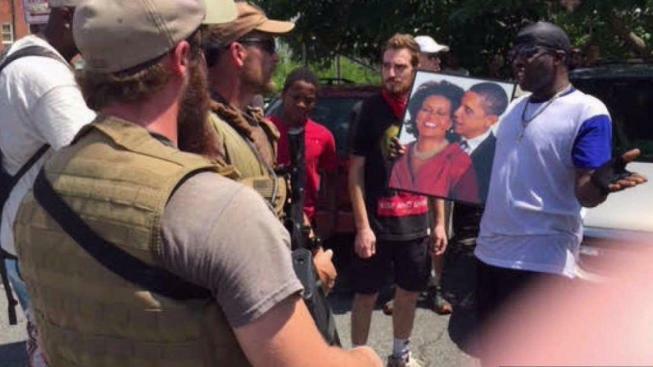 But it was protesters decked out in military gear and wearing assault rifles that she found most disturbing. "That was shocking -- walking next to people with this artillery," Savini said. Savini was just a block away when a driver plowed into a group of counter protesters, killing 32-year-old Heather Heyer. She said she saw another car attack in the parking garage she was in. "The woman, a white supremacist, hit the gas and started tearing through this group," Savini said. No one was seriously hurt in that attack. The "Unite the Right" protest was initially focused on denouncing plans to move a statue of confederate General Robert E. Lee, but Savini said it was clear to her much more was going on. "This was pure hate. There was no sign saying save the General Lee statue," she said. "It was nothing like that." After watching it first hand, Savini said she is even more disappointed by President Donald Trump's comments responding to the violence. "I don't think I've ever seen him come down so softly on anything, so why this?" Savini said. "It was so horrendous."